This identifies a field as being a key field of a table. Key fields of a table must be located together without any non-key fields between them and be at the beginning of the table definition. I.e. If a table has 3 key fields they must be in position 1, 2 and 3. This stores the check table name of the foreign key relationship. If key fields of the table are being used to check foreign key entries, only key fields of the check table can be contained in the foreign key fields. A foreign key creates a link between two tables, the CHECKTAB and DATATAB. Every primary key field from CHECKTAB is assigned a field within your DATATAB(foreign key fields). The main function of a foreign key is to improve data integrity, ensuring only data contained within your check table is inserted into the foreign key field. The check table is also used to validate input help values (i.e. F4 help) and are the basis for defining lock objects, maintenance views and help views. This stores the Data type used by the runtime environment. Please note you can’t change the internal type explicitly. It is determined from the contents of field DD03L-DATATYPE during activation. Stores the length of the field i.e. Number of characters including decimal places. Any formatting characters used for display/output purposes such as commas or periods are not taken into account here. A reference table is specified for fields containing currency amounts (date type CURR) or quantities (data type QUAN). This must be a reference field with the currency key format (data type CUKY) or format for quantity units (data type UNIT). If entries are made to a currency amounts field, the associated currency from the assigned reference field is determined at runtime, based on whatever is contained in the reference field at this time. This then determines which currency is used. Can field have NULL value? Select this flag if the field should always be filled with initial values based data type of the field. Please note that fields in the database which do not have this flag set can also be filled with initial values but setting this flag forces all table entries to have initial values in this field. •	The initial value cannot be set for fields of data types LCHR, LRAW, and RAW. If the field length is greater than 32, the initial flag cannot be set for fields of data type NUMC. •	If a new field is inserted in the table and the initial flag is set, the complete table is scanned on activation and an UPDATE is made to the new field. This can be very time-consuming. •	If the initial flag is set for an included structure, this means that the attributes from the structure are transferred. That is, exactly those fields which are marked as initial in the definition have this attribute in the table as well. •	Key fields are always filled automatically with initial values. 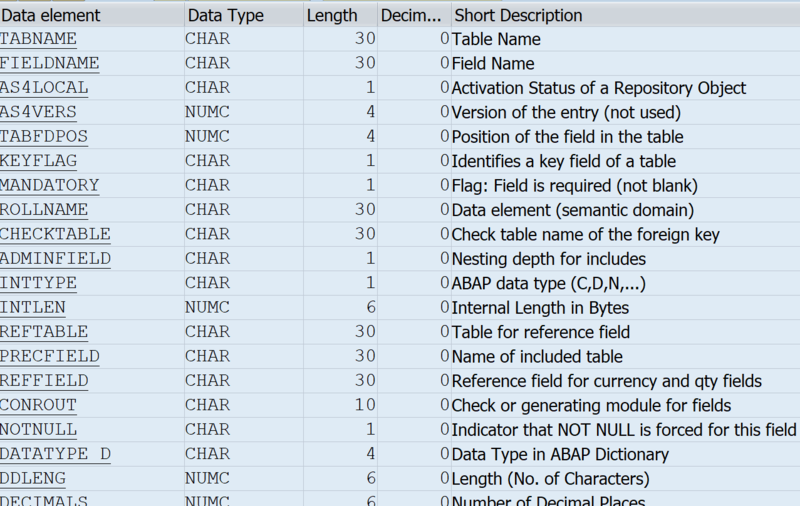 An SAP domain describes the technical attributes of a field, such as the data type or length. The domain can also define a value range describing the valid data values that can be entered into fields/data elements that refer to this domain. Domains allow different technical fields of the same type to refer to the same domain. These fields are then updated at the same time the domain is updated, ensuring the consistency of these fields. This contains the field of the reference table which contains the relevant quantity unit or currency field. Please not this could be the current table. A field containing currency amounts (data type CURR) must be assigned a reference field including the currency key (data type CUKY). A field containing quantity specifications (data type QUAN) must be assigned a reference field including the associated quantity unit (data type UNIT). This field stores whether and possibly how an input help is attached to the field. If more than one of these mechanisms is possible for a field, the first one mentioned is used.